Whether you want to play a catchy tune, entertain yourself, play music with your family and friends, educate your child, express your deepest passion, or pour out your blues - learning the saxophone can be easy and fun! If You’re Learning to Play the Saxophone, then You’ve Come to the Right Place. I'm a saxophone teacher who specializes in teaching beginners. I have been teaching people of all ages this wonderful instrument since 1981. Whether you are 8 or 85, I have a learning program that will have you feeling accomplished in a very short time. We'll begin right from the start. We'll look at all the parts of the saxophone, find out their names and start putting the pieces together. Halfway through, we'll make our first sound with just the reed on the mouthpiece and neck. There are an MP3 tracks to let you hear what to expect. Then we'll finish assembling your sax, learn where to put your fingers for the note A, and play a simple exercise. Today we'll learn the basics of reading music. You'll be introduced to the staff, treble clef and two kinds of note. To make everything crystal clear you can listen to the MP3 tracks while you watch the exercises being played. When I teach this lesson live to beginners, it generally takes around 35 minutes. To play in tune with the backing tracks, and other performers, you need to know how to tune your saxophone. This is a skill that can take a long time to learn, so I've introduced it early in your tuition. I played for years without much idea of whether I was sharp or flat. It seemed more by good luck than good management if I happened to play in tune. These days, I believe I'm improving. Playing music is as much about learning to listen well as it is about blowing notes. Don't worry if you can't tell whether you're in tune or not at first. Some people take longer to catch on that others. In this part you'll learn how to play the note B, and where it is located on the staff. You'll play a few exercises with the notes A and B, and pick up a few tips about music notation. This is a snappy little number that's very easy to tap your foot to. The tempo isn't fast so it shouldn't be too much problem for you to keep up. Later on in the lesson, you'll learn the note C, and then play a couple of pieces with C included. In over 25 years, I've never met anyone who was too old to learn. The only reason I say you can be too young to learn is size. Even a soprano saxophone is large for a small 5 year old. The average child isn't big enough to hold an alto sax until they are at least 8 years old. The oldest student I have had was in his seventies. He only had one lung and no tips on his little fingers. It was such a pleasure to see a man with his handicaps discover the joy of playing the saxophone. If I could help him do it, I know I can help you! The only advantage children have over adults is that they haven't convinced themselves that they can't do it. Adults often pressure themselves into reaching a certain goal by a certain date. Children are usually undistracted by the demands of a keeping a family fed, clothed and housed, thus are able to enjoy learning in a relaxed time-rich manner. My system works for all age levels. Whether you have a child who wants to learn the sax, or you are finally ready to do something you always dreamed of doing, I have developed a program that gives children the room to explore that makes learning fun and adults the sense of progress that they require. The Art of Saxophone uses a teaching method that really works. This method has evolved since 1983 into one of the best methods for learning saxophone available. If you do a Google Search on "Andrew Scott Music Progressive", you will see how widespread my work is. I have written more than 50 books for the Progressive series. Those titles included books on how to play the recorder, flute, saxophone, clarinet, guitar and keyboard. When I parted company with the Progressive series in 2002, I rewrote, upgraded and republished most of those books. These newer editions reflect improvements because I listened to the students and teachers who use my materials. Now my methods make learning even easier. The Art of Saxophone uses the best methods available to give you quick mastery over the instrument. . All together, more than one million people of all ages have bought my works and tested these methods. The Art of Saxophone is a 64 page eBook and MP3 package that you can download right now (or you can have a physical, printed book shipped to you in the post). The package is an ideal introduction to the saxophone at any age. It provides a clear, easily paced structure that lets you or your child become accomplished through 64-pages of instruction and bonus materials. How to Make a Sound You Love. Unlike a piano where you just strike a key and sound comes out, you must learn the skill of making sounds with a saxophone. I show you how to make sounds with just the reed, mouthpiece and neck before you even put the saxophone together. How to Put the Saxophone Together. From putting the reed into the mouthpiece to assembling the entire instrument, you will be an expert in no time. 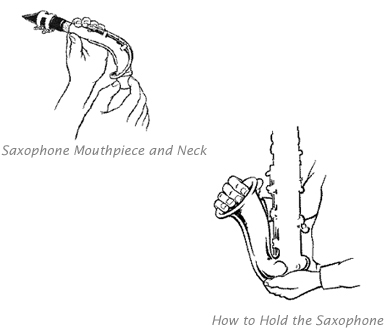 How to Hold the Saxophone. I'll teach you how to protect your investment, so the keys aren't damaged. How to Place Your Fingers. The simple charts show you exactly where to put your fingers for every note in the book. How to Blow and Breathe. Once you are shown how to blow and breathe, you'll be amazed at how easy it is! How to Tune the Saxophone. By the end of your third lesson, you will know how to tune your saxophone so you can turn playing saxophone together into a family experience. How to Read Sheet Music. Sheet music is written using a simple code that has evolved over hundreds of years, a little like writing, but not as old. Most people crack the code fairly quickly, and my book is here to help you. And don't worry, they are the same notes you will find in other sheet music, too. How to Play Familiar Tunes. Included are 80 exercises, songs and pieces because I've discovered that you learn faster if you already know the tune. Even if you have never read a note in your life, don't worry. I've organized everything in easy to follow steps so that you can absorb information and develop your skill at a comfortable pace. Each lesson leaves you feeling a sense of accomplishment. Good service, prompt delivery, easy to follow book. Thanks! Once again, thank you for a quality item. I am very happy!!!!! Each one of these people discovered the unparalleled joy of developing their latent musical talent using The Art of Saxophone. You can, too, though you can get even more than they did, because now I have added some bonuses. Bonus #1-Training your ear so you can be the star! It's easier to play songs that you have heard before and already know. I want you to start enjoying the saxophone immediately, so I am throwing in MP3 recordings of the more than 85 songs and exercises in the book. Each piece is played twice. The first time the band plays with the saxophone, so your ear learns to hear the tune against the harmonies of the band. On the repeat, you become the soloist with a full band backing you up! 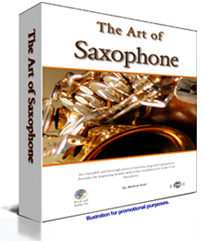 This is a $19.95 value included at no additional cost when you purchase The Art of Saxophone eBook. A MIDI file is a computerized recording of a piece of music. It contains a list of instructions that tell your computer to generate sound through its soundcard. You can find MIDI files of almost any piece or song you've ever heard through Google. You can't play back a MIDI file on your home stereo; they will only work on your computer. Bonus #2-MIDI files for use with Bonus #3. Have some fun while learning at your own pace. The most important background tracks are supplied in this format. This is a $9.95 value included at no additional cost when you purchase The Art of Saxophone eBook. For less than the cost of one lesson, I am offering you the essence of everything I have learned as a professional saxophone player and teacher over the past 25 years in one package. I don't want any deals or bundled offers. I just want one printed copy, or I am a teacher, or I have a store and want to order copies to resell to my students or customers. You get a money back guarantee. I'm so confident that you'll find The Art of Saxophone worth every penny that I will refund your purchase price after 30 days. All I ask is that you give the program an honest 30-day trial by playing through the exercises and songs. If you haven't made satisfactory progress at the end of that time, simply email me, and I'll refund your money in full. Are you uncertain? Remember, I've already offered you 5 free lessons. Why don't you check out the free lessons right now? I want you to feel confident that this is one of the best ways for you to learn to play the saxophone. P.S. The ability to play a musical instrument is a fantastic achievement right within your grasp. It boosts self-esteem and increases self-confidence. What better gift can you give your children or yourself? Don't pass up this opportunity to add depth and richness to your family's life! "P.P.S. There is music inside everyone. Let it out today!